After a 70-92 2017 season, the Mets have left most of their fans expecting a rough 2018 campaign. Since the end of last season, the Mets have more or less kept the team intact. The three notable changes have been hiring Mickey Callaway as manager, signing reliever Anthony Swarzak, and signing Jay Bruce (whom the Mets traded away in August). While I like the Swarzak and Bruce moves (and the jury is out on the Callaway move), let us not act like these moves make the Mets major playoff contenders. Let us examine the hypothetical world in which the 2017 Mets had Anthony Swarzak and did not trade away Bruce in August. At best, that Mets edition might have been 5 games better than the actual 2017 team. This is a very generous “at best”, but I will go with it. In that case, the 2017 Mets would have finished 75-87. Keep in mind that the 2017 Mets had Jose Reyes for the full year and Neil Walker, Lucas Duda, Curtis Granderson, and Addison Reed for most of the year. All of those players are now either gone or currently free agents (whom the Mets could potentially sign). While none of those players is going to set the world on fire by himself, those five players nevertheless represent a great deal of talent to lose. The Mets would have likely been at least 4 games worse without them for the full 2017 season. Meanwhile, the Mets would have likely been at least 5 games better last year with Noah Syndergaard healthy all season. The sum of those alternate-reality scenarios would have put the Mets at 76-86 last season. That “76-86” mark is important, because that is the record that I feel the current Mets would have attained if they had played together for all of 2017. Therefore, how are the Mets to improve by 14 games to gain a playoff berth in 2018? One way would be for the Mets to go out and sign big-time free agents at catcher, second base/third base, and starting pitcher. Wait, why are you laughing so profusely??? Oh yeah, that’s right. The Wilpons have too much debt and never spend a lot of money. Therefore, that “spending lots of money” option is off the table. Forget about Yu Darvish. Forget about Lance Lynn. Forget about Mike Moustakas. Move Matt Harvey to the bullpen. This is my #1 way to improve the team. The guy comes into every start wanting to blow people away. I guess this is how he impresses his supermodel girlfriends, so I guess I do not blame him. However, Harvey clearly has a closer’s mentality. Starters have to manage their way through several innings. They cannot max out on every pitch like Harvey tries to do. Harvey often does well in the first and maybe second innings of games. Then he completely falls apart. He had a 4.86 ERA in 2016 and a 6.70 ERA last year. That is where having a plethora of 5-or-6-run 3rd and 4th innings will land you. The guy should be a closer. This role will allow him to pitch one inning per appearance and max out each time. He will end up throwing no more than 80 innings, which is good for a man with as many physical ailments as he has. Plus, I know he really does not want to be a closer, but I really don’t care (Demi Lovato). He is lucky he is still in the majors, and he can wave bye-bye to the massive contract that 2015 Matt Harvey thought he would earn in 2019. Starting pitchers with ERAs approaching 7.00 are not given very good contracts if they get any contracts at all. However, good closers are at least paid moderately well. The Mets and he might as well try this option, as they have nothing to lose right now. As for the supermodels; if he is with a supermodel now when his baseball career seems broken beyond repair, he will do just fine after he starts to excel as a closer. Move Zack Wheeler to the bullpen. I have heard this nonsense about the Mets potentially using Harvey, Wheeler, and Steven Matz for no more than 4 innings per start. That sounds like an absolute train wreck over a full season. This plan will sound great when every reliever has already made 20 appearances by the end of April. So great. Anyway, sarcasm aside, the truth is that Wheeler is an unreliable commodity. After missing two seasons due to Tommy John Surgery, he pitched in 2017 to a 5.21 ERA. I do not care if he was once a hot prospect; he is currently a pitcher who has pitched poorly since returning from a two-year injury hiatus. Is it possible that he someday becomes a great starting pitcher? Of course. However, I would rather see him pitch in the bullpen first, so that the team initially relies on him for fewer innings. Give me a bullpen of Harvey, Wheeler, Jeurys Familia, A.J. Ramos, Swarzak, and Jerry Blevins. That is actually a fantastic bullpen. You can win a World Series with that pen….and other good players. Sign R.A. Dickey. 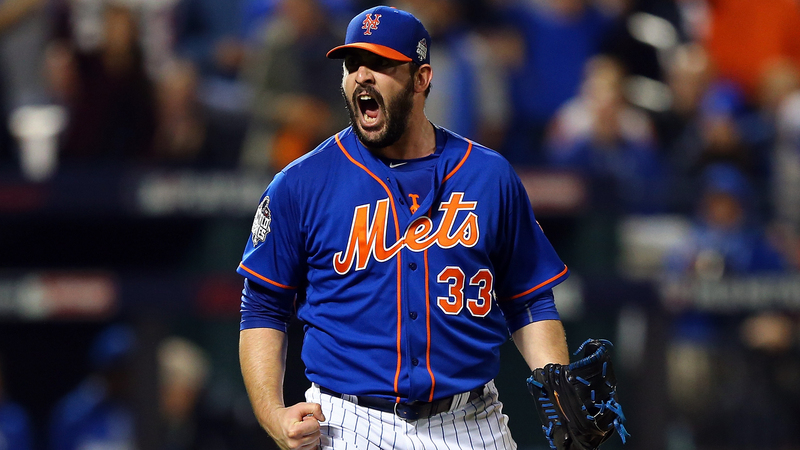 The key to the 2015 Mets’ pitching success was the reliability of Jonathon Niese and Bartolo Colon. That season, neither veteran missed a start. This was huge, as the Mets managed Matt Harvey, Noah Syndergaard, Steven Matz, and Jacob deGrom through injuries and innings limits. In 2016, Colon continued that reliability. However, last year, the Mets had no such starter. I wrote a lengthy post in August about the large number of Mets pitching starts of more earned runs allowed than innings pitched. That happens when you have to use the likes of Tommy Milone and Tyler Pill to make a whole bunch of starts. If the Mets sign Dickey, a fan favorite, to a presumably relatively cheap contract, they will have that veteran starter. He should be able to give the Mets a regular 6 innings pitched and 4 or fewer earned runs allowed. Plus, Dickey would allow the Mets to have three somewhat sure things in the rotation – deGrom, Syndergaard, and Dickey. Meanwhile, Steven Matz would be the fourth starter, and Seth Lugo would be the fifth starter. Both of those are unknown quantities. Matz can be the ace of the staff when healthy, but he is never healthy. Lugo has pitched to too small a sample size for me to judge him accurately. If one of those guys can stay healthy and effective, the Mets’ rotation should be just fine. 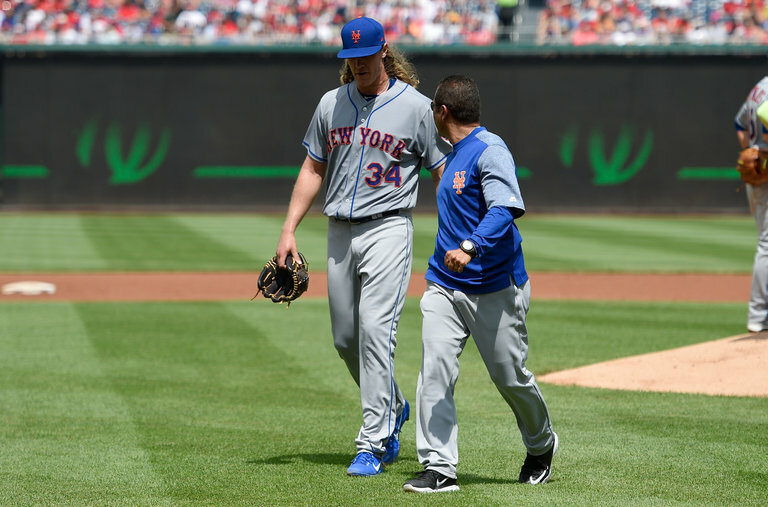 Rafael Montero would likely be the fifth starter if one of these two cannot get the job done. Hopefully, it does not come to that. Actually, the ideal scenario would be for the Mets to sign Jason Vargas as a fourth starter. That would give the Mets six legitimate starters and two sure-thing veteran pitchers. It would mean the Mets could avoid Montero as long either Lugo or Matz is healthy. However, even Vargas is probably too expensive for the Mets. However, I really really really wish they could sign him because that would make me feel excellent about the rotation. Bring back Jose Reyes. While most of us Mets fans were ready to run Jose out of town last spring, he ended up having a good season. He could play second base or third base in 2018 and could bat leadoff or further down in the order. This would give the Mets plenty of roster flexibility. Reyes, Asdrubal Cabrera, T.J. Rivera, and Wilmer Flores could play second base or third base. Meanwhile, Jay Bruce, Wilmer Flores, and Michael Conforto could play some first base if Dominic Smith struggles. At the same time, a bench with Smith, Brandon Nimmo, Flores, and Rivera is fine with this lineup. Meanwhile, Yoenis Cespedes is clearly a front-runner. With a good team, he is inspired to be a great player. With a bad team, this is far from the case. In the end, I am not saying that the aforementioned moves would guarantee the Mets a playoff berth. However, I do feel that the combination of a healthy and more motivated Cespedes, a healthy Conforto (he did miss the last six weeks of 2017 too), 30 MLB starts from R.A. Dickey (as opposed to a potential of 30 starts from fringe MLB pitchers), slightly healthier seasons by Matz and Lugo, an improved Amed Rosario, the return of Jose Reyes, and a revamped bullpen make it possible that the Mets earn those 14 extra wins needed to reach 90 and a likely playoff berth.